Porta Palatina is a remarkable body of ancient Roman times, which can be seen in Turin. 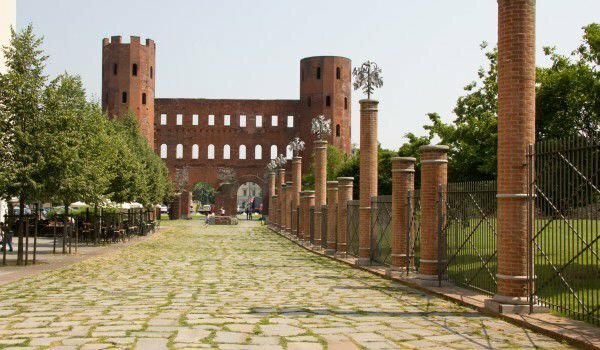 Porta Palatina was one of the four main city gates, which allowed access from the north to Cardus Maximus, which was usually the largest and second main street in the Roman town. This historic building located Near Duomo di Torino and Palazzo Reale. Porta Palatina consists of one main gate and two polygonal towers, which stand on both sides. The only part remaining of the original structure is precisely the main door and the rest is a tower added in middle ages - Teeth of Porta Palatina, dating from 1404. Porta Palatina’s name comes from the latin "Porta Palatii”, which translates as palace door, which was linked to the royal palace, which ran many historical figures such as Lombardian kings and Charlemagne. Later the place became the seat of municipal authorities. In the early 18th century in Turin has been extensive construction reform as a result of which appear among the most beautiful and intriguing buildings in the old city center. These early years of the 18th century Porta Palatina also underwent significant restoration in the caring hands of the architect Antonio Bertola. It is assumed the original Porta Palatina was built sometime in the late First century. Slightly more than 17 centuries later, Vittorio Amedeo II of Savoy decided that this ancient structure is outdated, defacing Turin, and it is time to destroy it. Fortunately, the main merit of saving the Gate Platinum is to the architect Betola. He managed to convince the ruler that deletion of such a historical landmark is unacceptable. Between 1860 and 1934 many representations that Porta Palatina be restored to original appearance of the structure were made. The antique building is isolated from most of the city, and even a few knocked down homes are located near the Roman monument. During the fascist government in front of the monument are placed two bronze statues that are copies of older ones. In 1961 to commemorate the centennial of the unification of Italy, Porta Palatina mounted a light installation by Guido Chiarell. Today Porta Palatina is one of the beautiful and serene places where you can walk in Turin. The ancient Romans structure is surrounded by a pleasant park, which was implemented in recent years, and aimed to return the maximum authenticity and purpose to Porta Palatina.